Digital marketing is the promotion of brands or products via electronic media. Digital marketing differentiates itself from traditional marketing in that its methods and channels allow businesses to gain insight into marketing campaigns to determine what is and isn’t working. Digital marketing is a highly coveted skill that businesses desire desperately. The world has never been as interconnected as it is today, and businesses are doing everything in their influence to reach as many customers as they can. As a result, digital marketers are high in demand. Those who are interested in a career in digital marketing have a range of jobs to choose from. These include internet marketing specialists, digital sales executives, search optimization (SEO) marketing specialists, or digital marketing directors (amongst other job titles). These various digital marketing related jobs come with an entire range of pay grades. The most common position, however, is the digital marketing associate. Digital marketing associates can be either part time or full time, and they report directly to the digital strategist (or someone with a similar job title). As mentioned before, these positions come with a range of salaries. 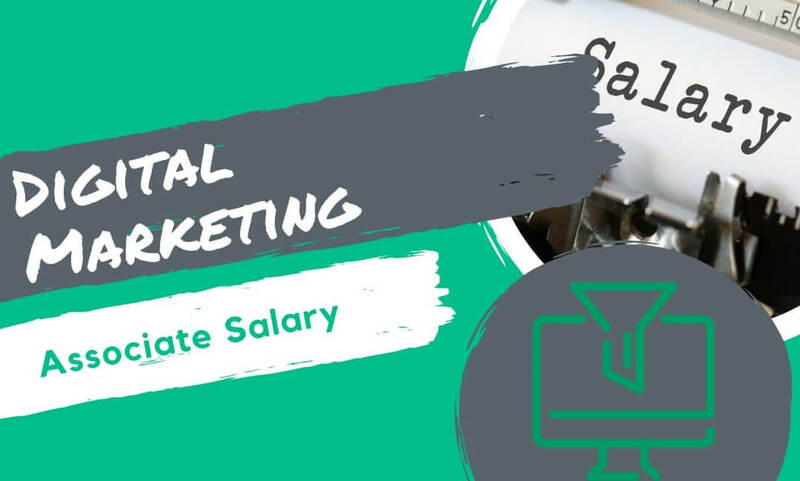 The question begs to be asked; how much is a digital marketing associate’s salary? Digital media has become such an integral part of our lives that consumers have come to expect information anytime and anyplace that they want it. Marketing has become extremely sophisticated yet simplified. For example, in the old days, businesses had to spend tens of thousands of dollars to obtain promotions in newspaper ads, on the radio, flyers, etc. However, there was no way to properly track conversions to determine which campaigns were working the best (except through questionnaires). With the advent of digital marketing, customer conversation data has never been easier to obtain. Digital media has morphed into an ever-hungry beast that spews outs entertainment, news, shopping, and content on a level that humanity has never experienced before. With so much information floating around, businesses have to always stay on the ball to not only reach new customers but to manage their reputation. One bad experience told to a big enough audience can cause irreparable damage to a business’s reputation. No longer are consumers influenced by only what businesses have to say about their brand, but what others are saying. Word of mouth, after all, is arguably the strongest form of marketing. People only shop with brands that they trust, thus tailoring digital ads to a specific group of people has proven to be an effective marketing approach. This is where the digital marketing associate steps into the picture. Before we jump right into the big juicy numbers, we’ll first examine in detail what digital marketers do. A digital marketer is responsible for developing and implementing a strategy that businesses will use to promote their products and services via online channels. This takes place via social media, e-mail marketing, and web analytics amongst other means. It’s the job of the digital marketing associate to put together these online promotions and email campaigns to communicate their company’s message to potential customers. They also perform consumer research to determine the best way to reach the maximum amount of online customers. Other job titles for digital marketing include SEO marketer, online marketing manager, and digital sales executive. Job listings for these positions include dedicated e-mail sales, direct response letters, and interactive advertising. Ultimately, it’s the job of a digital marketing associate to transform business goals into (hopefully) successful SEO campaigns as well as ensure that the clients that they help see an increase in search engine rankings for their websites. Digital marketers who hold positions of leadership, such as a director or manager, typically oversee marketing campaigns from start to finish. It is usually their job to guide the other members of the marketing team, such as web designers, sales executives, and copywriters. These are the individuals that digital marketing associates typically report to. The educational requirements to work in the digital marketing field typically vary depending on the job role. In most cases, a bachelor’s degree in Internet Marketing, or a similar area, is good enough. Of course, the business looking for a new digital marketing associate will let you know exactly what they need regarding an education. Companies want employees who are well versed in the basics of SEO, web analytics, pay-per-click advertising and the like. Such skills will lead to careers as a digital sales executive, digital marketing specialist, and an SEO specialist. When it comes to education for a career in digital marketing, knowledge of marketing (and all of its aspects) are key. You’ll be taking classes in campaign management, finance, and strategic marketing. You’ll also need knowledge of website usability, internet product branding, and web analytics. Viral marketing, affiliate marketing, and blog promotion will also be a crucial part of a digital marketer’s education. According to PayScale.com, the average digital marketing associate’s salary ranged between $36,068 – $61,716. Most make around $44,970 – $50,912. Beyond that, administrative positions, such as online marketing managers, fell into a range of $40,751 – $98,807. When it comes to bonuses, a digital marketing associate can expect to see anything from $225 – $6,251. Commissions can be as high as $1,000. With literally dozens of job postings every month for this field all over the country, digital marketing associates have plenty of job opportunities. Glassdoor.com does a magnificent job of listing salary rates for dozens of companies. You can also check out indeed.com to find the latest jobs available in the digital marketing field. If you’re pursuing a career in digital marketing, know that it pays well. Even the entry-level starting positions pay quite well, and as you improve and move through the ranks of your company to more administrative positions; your salary will only increase. If you possess the skills to pursue a career in digital marketing, it’s highly encouraged that you do so. Businesses are in great need of business savvy digital marketers who have the skillset required to deliver results.